"A lot of people try to imitate Mifune, but nobody can." Stop and watch this now! The first official trailer has debuted online for a fantastic documentary called Mifune: The Last Samurai, profiling the life and work of Japanese actor Toshiro Mifune. If you're a cinephile you're already very familiar with Mifune - he starred in numerous Akira Kurosawa films including The Seven Samurai, Yojimbo and Rashomon, as well as tons of other classic Japanese films. This doc examines his life work with old footage and photographs and tells his story from the early beginnings of his career, to his falling out with Kurosawa and final roles. Martin Scorsese and Steven Spielberg are two of the filmmakers who talk about how incredible Mifune was, with more special guests. I caught this film at the Telluride Film Festival and loved it - highly recommended. Nearly 20 years after his death and in the final run-up to his centenary, Toshiro Mifune remains a true giant of Japanese cinema. Rich with archive footage and personal reminiscences from family and friends, this Keanu Reeves-narrated documentary shines a light on both the man and the actor, starting with his childhood and military service, through to his early years in the popular 'chanbara' action movies that he would later draw on for a string of masterpieces made with legendary filmmaker Akira Kurosawa. Mifune: The Last Samurai reveals him as a formidable and mercurial talent, both onscreen and off, and offers rare insights into his background that draw intriguing parallels with Lee Marvin, Robert Mitchum and the Hollywood hard men of his generation. Mifune: The Last Samurai is directed by Steven Okazaki, of The Mushroom Club previously. The film premiered at the Venice and Telluride Film Festivals, and also played in London. Opens limited in the US starting November 25th, Thanksgiving week. Excited for this? Much respect. This will be one to watch for any one who loves classic cinema. As always, Bo, it is not hard to admit that someone's thoughts have some substance. As yours do so many times. I am also quite fond of mr. Reeves work and I also think he's doing fine in many of his projects. Yes, sometimes I think he could choose better ones, but, at least, he's honest at trying. And, from knowing what I know about him, he's a decent person. And intelligent one. I saw parts of that documentary you mentioned, Side by Side, and it was quite good which gives more arguments in mr. Reeves favor. So, ok, let's see how good is he going to be here, in this one. Hoping for the best, right? It's true, when I think of it, who would be the alternative... As for open mind, we both like it, right? And you noticed that nuance regarding mr. Reeves I wasn't sure about. Glad to be at anyone's disposal with that when it comes to conversation. Cheers! Yes, yes and YES--there was no actor more physical, visceral, volcanic--smoldering than Mifune. His performances were always mesmerizing. I am VERY MUCH looking forward to this documentary. 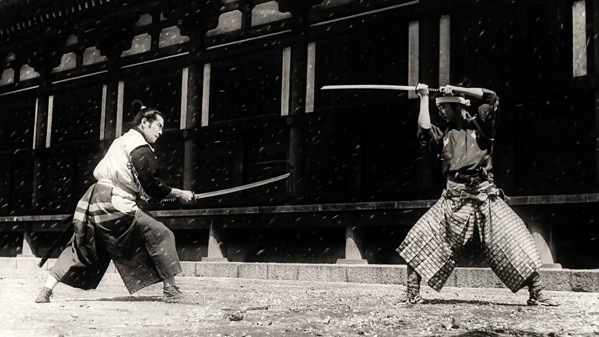 Mifune was the MAN! No denying. Even his supporting role in Okamoto's Sword of Doom, he totally steals the show. High And Low is one of the finest works of cinema I've ever seen. So glad this was made, can't wait to see it.